Pinky, the inspiration behind my record label. Last week I got the mastered files for my forthcoming album The Presence of Wonder, tentatively scheduled for release on April 12th. I can hardly wait to get this project out into the world as I believe it is my best work yet! But the truth is the time will go by very quickly as there is still SO MUCH WORK to do to get it ready for distribution. When I began this journey, I had no idea that the composing and recording of an album was the EASY part. 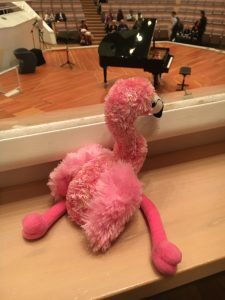 Since I self-publish my CD’s and sheet music (under the name Optimistic Flamingo Music), there is more behind-the-scenes effort involved than I ever imagined! First, an album needs a beautiful cover. Since I have approximately ZERO skills in graphic arts, I trust this part to Matt Strieby of Newleaf Design. I approach him with some vague notion of what kind of imagery I might like and I share the album concept and track titles with him. Then, while he is working his magic, I must put together the liner notes – acknowledgements and credits, brief descriptions of the tracks, an artist photo and bio, copyright info, etc. – and send all that to him. I also have to purchase a UPC code and an ISRC number for the album. After much back and forth, Matt creates with a print-ready cover that is absolutely PERFECT. I am very grateful for all that he does! Then, I must settle on a release date and schedule the album for distribution with CD Baby, who takes care of getting it out to Apple Music, Spotify, Pandora, and other streaming platforms, as well as submitting the music to the U.S. Copyright Office for copyright protection and getting it registered with Neilson Soundscan. I also have to submit it to BMI, a performing rights organization, in order to collect performance royalties, and to SoundExchange, in order to collect international royalties. In addition, I must set the album up for pre-release at BandCamp. I’m sure I’m forgetting something, but you get the idea! Each of these entities has a unique set of paperwork to complete, and getting it all done takes literally HOURS! Since I still love physical CD’s (as do many of my fans) those must be submitted for manufacturing; also, there is the matter of getting my sheet music ready: editing, proofreading, and printing (in addition, I offer digital PDF’s). Finally, there is all that must be done to let folks know about the release: update my website (with the help of my overworked and underpaid webmaster, AKA my brother – thanks, Eric!) update banners on Facebook, Twitter, Instagram, etc. (which requires further assistance from Matt), create videos to share bits of the work to create anticipation (once again, this necessitates working with a professional) and update my YouTube channel, and compose an email to send to my newsletter subscribers. It takes literally MONTHS to accomplish all of this – especially working as I do, catch-as-catch-can alongside seeing nearly 60 piano students each week and keeping up with all the professional obligations that go along with that. But somehow it WILL all get done – and then BOOM! – I hope you will join me in celebrating the release of The Presence of Wonder! Excited for you and proud of your skill sets!